Benefits include improved respiration, circulation, balance, metabolism, muscle strength and agility. It may seem more like play than therapy, but equine-assisted activities can help those with physical and mental disabilities. While there is little controlled research on the subject, physical therapists progress notes, as well as reports from physicians, teachers, and parents testify to its benefits. These benefits include improved respiration, circulation, balance, and body metabolism along with greater muscle strength and agility. The warmth and motion of the horse mimicking that of the human body can also reduce muscle spasticity in the legs, back, neck and arms. Mounting, dismounting and grooming are also useful in enhancing range of motion. Psychosocial benefits reported are improvements in self-esteem, self-image and interpersonal skills. Many patients also become more outgoing and children with autism have been known to communicate spontaneously for the first time with a horse! 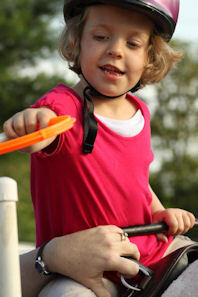 The recreational nature of this program allows a source of hope for people with disabilities. They can leave the standard clinical setting and enjoy an independence they never thought would be available to them. While on a horse, they’re “normal”, able to leave the bonds of their disabilities. They’re free! Go to our Forms Page for Participant Application, Scholarship Application, and Medical Forms. If you have other questions about our Equine-Assisted Activities classes, please e-mail info@eatherapy.org. Thank you for your interest and we hope to hear from you soon! How long are classes and lessons? Sessions are typically seven weeks long but are occasionally shorter due to holidays, weather, and facility availability. Each lesson is 40 minutes in length. That time includes the mounting and dismounting of all riders in that class. If your child takes 20 minutes to mount, that is part of the lesson. Current session dates are on our calendar. How many riders per class? Our ideal number of riders is four (4) per instructor, but depending on the class, that number may vary slightly. Each rider is asked to pay the full session cost of $50 per lesson, which totals $350 for a seven-week session. (We do provide need-based scholarships.) This small fee covers less than 25% of our operating costs. That depends on which location you prefer, what time slots we have open, and how flexible your availability is. There are a number of variables, but we do our best to get new participants in our programs as quickly as possible. Equine Assisted Therapy, Inc. has but one purpose: to provide horsemanship experiences to persons with mental, physical, and psychological disabilities in order to enhance the quality and productivity of their lives.